We wanted to include a BBQ wing sauce review in our Week of Wings II roundup this week. 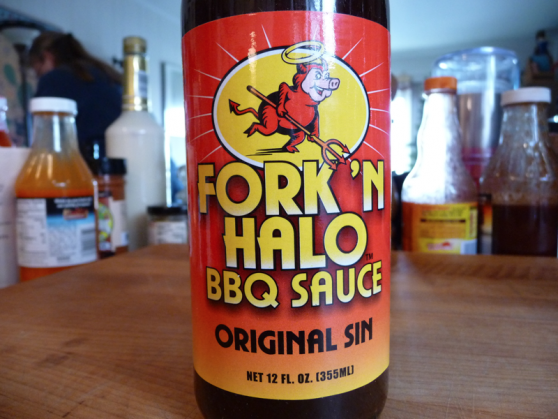 While the sauce itself is not marketed as a wing sauce, we chose the Fork N Halo to review, based on the pig in a devil’s costume on the label and the ingredients of cayenne pepper and jalapeno pepper. 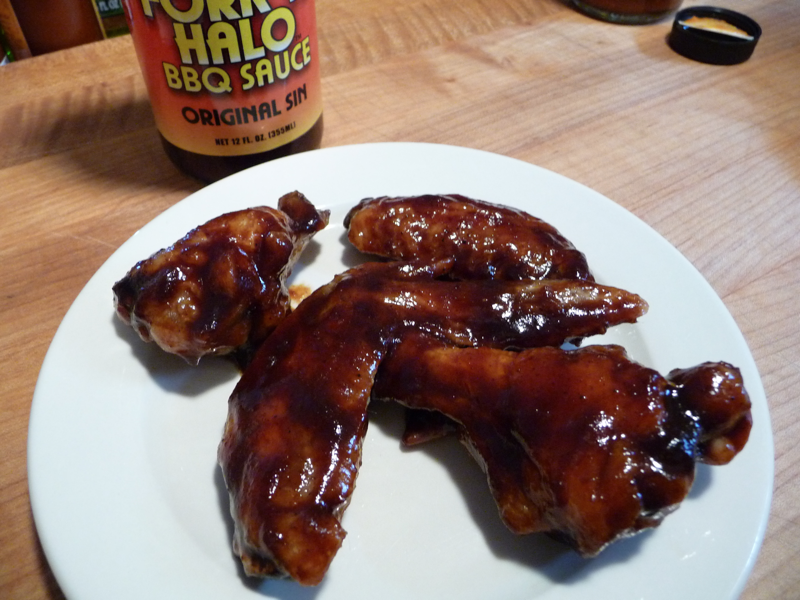 FORK ‘N HALO barbecue sauces are all natural and 100% fat free. They don’t contain any MSG, artificial ingredients or any of that high fructose corn syrup stuff. We even use evaporated cane juice instead of processed refined sugar. All Wicked Good BBQ Company products are made with the freshest ingredients, gathered from all around the world. The flavors are truly unique. This ain’t no ordinary BBQ sauce!!! Brian: This really isn’t an ordinary ordinary BBQ sauce. 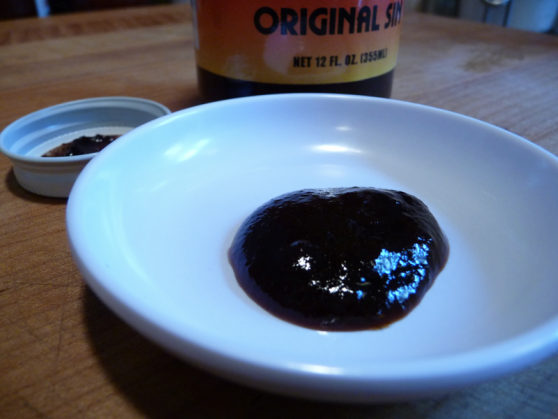 Our first impression was that this dark, sweet, thick BBQ sauce would be awesome on wings. However, there is very little to no heat, and the sweetness from the molasses is not something I personally care for. Marilyn: Really sweet, thick, lots of molasses. It almost tastes like raisins. Lots of honey flavor too. Texture & Appearance: – Very dark and thick – a pretty sauce actually – with the molasses being the biggest reason for the dark, shiny appearance. We really like the coarse consistency of this sauce. Taste: – We’ve had far worse BBQ sauces. If you like the molasses / honey flavors and really dig the super sweetness in your BBQ sauce, you may really like this. Brian: As I stated, these are not hot wings. They are BBQ wings with a very strong molasses flavor. I’m not a fan of molasses in general. I don’t feel the ingredients balance out well, especially since there is little to no heat from the cayenne or jalapeno pepper in this sauce. Marilyn: A very sweet flavor with lots of honey. I would probably only eat one of these at a party or gathering. I don’t mind the molasses flavor as much as Brian does. This sauce may be better on beef or ribs than on chicken wings. Heat Level: – There is only a slight hint of spices in this sauce. Label/Graphics: – With the simple graphics, they get 2 stars for the inclusion of the pig in the devil’s costume and along with calling it Original Sin both led us to believe there would be more zing in the bottle. Overall Rating: – Just disappointing to us. We have our preconceived notions of BBQ sauce – heavy tomato, or mustard, or vinegar… but molasses is not one of them. You may love it. You can purchase Fork N Halo Original Sin here on InsaneChicken.com who also offers 2 other flavors – Heavenly Hickory and a Fire and Brimstone. For Day 4 we wanted to bring you a dry rubbed wing review. We chose the All American Spice Rub from Pork Barrel BBQ. Simply a top-notch rub from a great company. We marinated these wings in 3 Tbls. EVOO, with 1 tsp. of rub for a few hours. Then we cooked them as usual by baking in the oven (20 minutes at 375° then a quick fry in canola oil at 375° to crisp them up and finish them). See our Wings 101 post for details. The result was a crispy, delicious, wing with an umami taste that rivaled anything else we had tried with other rubs. Though not hot, the flavor profile was enough to make us look at each other and say, “OMG, these are so good!” Most folks think of wings as being hot or buffalo-style in order to enjoy them, but we could go back to these again and again and could serve them to everyone, even the non-hot sauce folks (read: parents), and get rave reviews. Texture & Appearance: – Almost a perfect balance of textures – coarse to medium. Taste: – even though salt is the first ingredient, this rub is not salty. Sweet, savory, piquant… a great all purpose rub. Heat Level: – light, mild heat. There are ancho and chipotle peppers in this mix, but very understated. Some of you might find it slightly spicy, while the Chilehead might find it tame or mild. We think it falls just a notch above that. 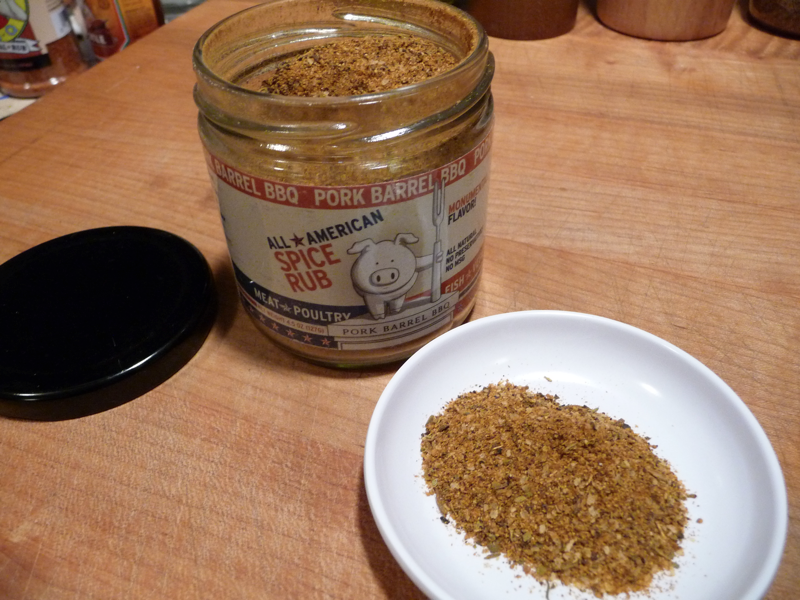 Label/Graphics: – This rub is packed in a 4.5 oz glass jar (a plus) with a simple label. It reads “Spice Rub” first, then you see the pig with fork statue – very Washington DC-y – and the banner of “Pork Barrel BBQ” around the top. The fact that it’s for Meat – Poultry – Fish – Veggies shows up also. Great packaging in the glass jar with a simple clean label. Overall Rating: – This is our first review of their All American Spice Rub. We can’t wait to see how it fares on ribs, pulled pork and brisket. Stay tuned! 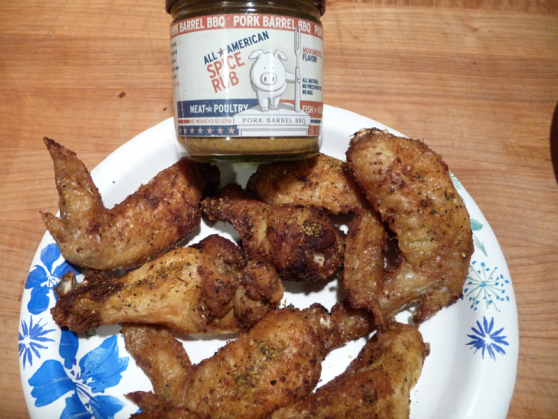 You can order the All American Spice Rub from Pork Barrel BBQ – tell them Hot Sauce Daily sent you! Two congressional staffers from Missouri, Heath Hall and Brett Thompson, were lamenting the lack of a good barbecue joint in Washington, DC, during a late night Senate debate over pork barrel spending. An idea popped into their heads, and Pork Barrel BBQ was born. They were named Best BBQ Sauce and #75 of the #125 best foods for men by Men’s Health Magazine. We were happy to hang out with them in 2010 at Pork in the Park in Salisbury, MD. Since then, they have gone on to win many awards across the country, and even rang the closing bell at the New York Stock Exchange along with their investors. They are now preparing to open their first restaurant in the Del Ray neighborhood of Alexandria, VA, later this year. These are two of the most down-to-earth, nicest guys you could meet. We hope you enjoyed this review and will get yourself some or all of Pork Barrel BBQ’s products!